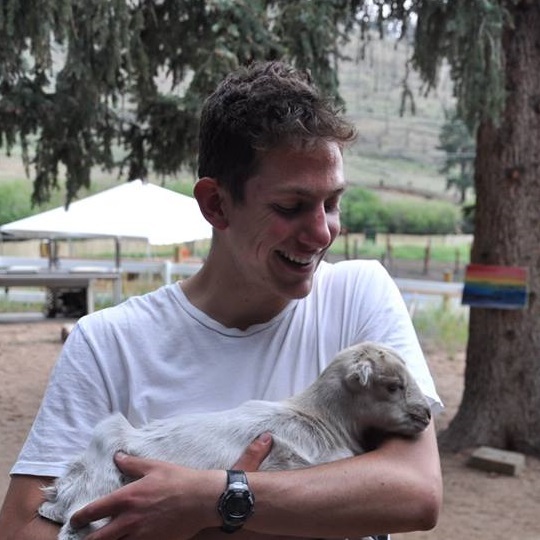 Guest blogger: Dave Yedid, a third-year staff member at Ramah Outdoor Adventure in Deckers, Colorado. Dave is a student at Middlebury College in Vermont. During the final week of May, I attended the National Ramah Spring Leadership Training Conference at Ramah Darom in Clayton, Georgia. Orlee Krass and Tali Cohen led the training for staff members of special needs programs, and facilitated sessions on sensory processing, executive functioning, the ABCs of behavior management, modifying programming, and sensitivity training. We also spoke on Skype with parents of Tikvah campers as well as experts in the special needs education field. On the last day of the training, we did a Tikvah tefillah service, singing “Rise and Shine” and other awesome, sing-songy variations to our favorite shacharit prayers. I have been working with campers with disabilities since 2012, when Elyssa Hammerman piloted a special needs program at Ramah Outdoor Adventure. It is a separate eidah called Amitzim. My two weeks as a madrich with Amitzim were my best in camp. It was much more tiring than working in a typical eidah, but each camper inspired me with his or her openness, intellect, curiosity, honesty, and eagerness to learn. I remember last summer witnessing how the behavior of the Amitzim campers had changed from one havdalah ceremony to the next. At the first havdalah, they were overwhelmed by the ceremony; by the second, they were leading the ceremony! One camper read a poem she wrote to the whole camp, and others carried braided candles and spices around the circle during the brachot. This year, my third summer at ROA, we are piloting an inclusion program so that campers with higher functioning can mainstream into typical tents. The most salient part of the training was speaking to other Jewish counselors–both from other Ramah camps and URJ Camps, who were invited to attend this year’s training–about their visions and ideas for inclusion camping and what brings them back to camp every year. Counselors spoke of not having to choose between their secular and Jewish identities, the beauty and resonance of living in and creating an immersive Jewish community, and the satisfaction and joy they get when they see their campers’ growth during camp, from summer to summer. It was special to me to hear why working with campers with disabilities was more challenging and more rewarding for other counselors, and the strides their special needs programs have taken during their time as staff members. Counselors spoke of struggling to integrate campers with special needs with their typical peers, shadowing a camper one-on-one who wants independence, and working in a camp environment where other campers don’t understand what special needs are. It was clear that everyone saw something special in his or her respective camp bubble. But it is imperative that we leave that bubble on occasion so we can seek out other perspectives and strategies on how to make our camp communities more inclusive, sensitive, and affirming. Even if I can’t perfectly articulate why, I believe there is something distinctly Jewish about including community members with special needs. After this collaborative training, I feel more comfortable reaching out to the intelligent, passionate, and dedicated Jewish educators and bouncing ideas and concerns I have off of them. As a very wise Tikvah director once said, “Every person has special needs. I have them, you have them…Some of us might need a long hug every day, some might need a long time to fall asleep at night, some of us like specific foods. We try our best to make sure all of those people’s needs are fulfilled so that they all feel supported here.” And the training did for the counselors and dedicated special needs staffers what they do everyday for the campers–made them feel welcome and supported.